This Northern Pygmy-Owl appears to have eyes in the back of its head. But why? One theory is that large false eyes may create the illusion that the owl is much bigger than its 6 and 3/4-inch size. 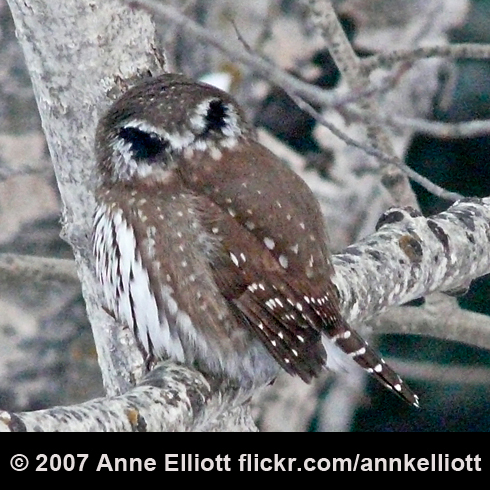 A more current theory is that the false eyes help protect the pygmy-owl's true eyes. Small birds will mob this diurnal owl, even striking it, directing some attacks at its eyes. If the large false eyes can take the brunt of these attacks, little harm will come to the Pygmy-Owl's vulnerable true eyes. Support for BirdNote comes from Song Bird Coffee, offering bird-friendly organic shade-grown coffee for holiday giving. More at birdnote.org/songbird. Back in grade school, we all likely had a teacher with an uncanny ability, even with her back turned, to sense when we were up to no good. You might say she had eyes in the back of her head. There's always more to the story, at BirdNote.org. I’m Mary McCann. Sounds of the birds provided by The Macaulay Library of Natural Sounds at the Cornell Lab of Ornithology, Ithaca, New York. Northern Pygmy-Owl recorded by G.A. Keller; Black-capped Chickadees by R.C. Stein; American Robin by R.S. Little; Red-breasted Nuthatch by W.L. Hershberger. For background on pygmy-owl false eyes, see Geoffrey E. Hill’s Bird Coloration, Washington, D.C.: National Geographic Society: 2010.